First and foremost, make sure you are registered to vote at your current address. Go to MyVote.WI.gov, select "Register to vote," and enter your name and date of birth. If you find out that you are not already registered to vote at your current residence, see this information on voter registration options and deadlines. And then make sure that every family member, friend – anyone you know who is eligible to vote – is registered, too. Don't let up after today. This is too important. Next, if you think there is any chance that you won't make it to the polls on Election Day, then vote early. Early voting started yesterday at multiple sites in Madison and Milwaukee. To find out where and when you can cast an early, in-person absentee ballot in your city/town/village, contact your local municipal clerk. Here is more on what you need to know about casting an early, absentee ballot – in-person or by mail. Read it – and share this link widely. You will need to present one of the acceptable IDs pictured left when voting in Wisconsin, so take a moment and check to see if you have the ID you need to cast a ballot early or on Election Day. If you don't have an acceptable ID, review the information on our downloadable fact sheet on voter ID and/or visit Bring It To The Ballot. You can also contact one of these two voter ID hotline numbers for assistance from our friends at Vote Riders: (844) 338-8743 or 414-882-8622. Want to do more? How about volunteering? We've said many times that if we want our democracy to work, we have to show up. But for those without transportation to the polls, "showing up" can be tough, if not impossible. In response to this need, CC/WI is identifying and recruiting organizations and individuals statewide who are willing to offer free rides to the polls during early voting, on Election Day, or both. We will be publishing a list of these individuals/groups this week, and updating it regularly as more volunteers are added. If you are interested in being a driver or know of any folks in your area offering this service, please contact CC/WI by email so that we can add them to our list! Another way you can help is by volunteering as an Election Observer. Our longtime partners, the League of Women Voters of Wisconsin, are providing online training to folks statewide. Just sign up using the League's online Election Observer Volunteer Form. Or, if you prefer, contact Sandra Miller at CC/WI. 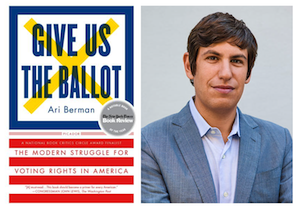 Cap off your National Voter Registration Day by joining us tonight at 7PM in Madison at the Goodman Center (149 Waubesa Street, Madison 53704) where political correspondent Ari Berman from The Nation Magazine and MSNBC will speak about his timely new book Give Us The Ballot in which he talks about the intense, ongoing struggle over voting rights in America since passage of the Voting Rights Act of 1965. CC/WI is presenting this event in partnership with the Center for Media and Democracy and the Wisconsin Book Festival. More details are here. Hope to see some of you tonight! If you are in the Fox Valley area, Ari will also be speaking at UW-Green Bay on Thursday, September 29th. And finally, National Voter Registration Day isn't about paying attention for just this one day, but rather, it is a day meant to highlight an important step that all eligible voters must take to preserve our democracy. Take the step, and help as many people as you can do the same.